There's been an increasing amount of media attention to the topic of Traumatic Brain Injury (TBI) -bolstered in part by conversations surrounding the 2015 Hollywood blockbuster Concussion. The movie Concussion describes a particular phenomenon, Chronic Traumatic Encephalopathy or CTE, which occurs in the brain after repeated high impact blows to the head. The diagnosis of CTE requires examining brain tissue under a microscope after death, so it can't be diagnosed in living individuals. But in fact, there are many types of TBI, with concussion being the mildest (but most common) form. Today, brain mapping techniques are making it possible to identify TBI and track recovery. Physicians divide cases of TBI into three categories depending on severity: mild, moderate, and severe. Severity is determined by brain function, measured at the time of injury as reflected by a person's pupillary response, verbal response, and motor response. These findings can be summarized by the score on validated assessment tools such as the widely used Glasgow Coma Scale (GCS). The lower the GCS score, the more severe the TBI. A closed-head injury (closed meaning no object penetrates the brain) results from a violent or sudden motion, such as whiplash in a car accident, which causes the brain to hit the skull. This is the most common form of moderate to severe TBI. Due to the violent motion, the brain experiences rapid acceleration and deceleration forces, causing shearing of white matter pathways as the brain hits against the skull. White matter pathways consist of axons that are wrapped in myelin, a fatty tissue that allows the electrical signal in our brain to travel with greater speed and efficiency from one brain cell to another. Because our tools can measure white matter non-invasively in the brain, we can now identify these devastating injuries. One of the most common techniques for assessing TBI in its chronic stage (one year after injury) is diffusion weighted imaging (DWI). 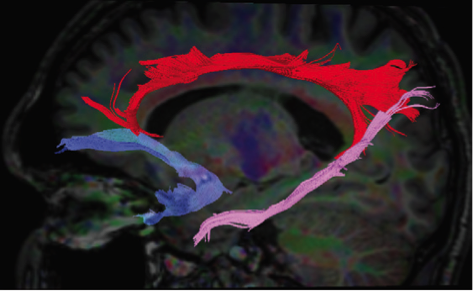 DWI measurements are made using a magnetic resonance imaging scanner to measure the motion or diffusion of water molecules, allowing researchers to map white matter pathways in the brain. These pathways, or tracts, allow brain regions to communicate with each other and specific tracts have been linked to various psychological processes. For example, integrity of the uncinate fasciculus (see image below) has been linked to memory and socio-emotional processing, two aspects of brain function that are often disrupted in people with TBI. While DWI is sensitive to some types of injuries related to TBI, much work needs to be done to improve the sensitivity of our techniques, especially to reveal the pathology due to types of TBI such as CTE (progressive degeneration of the brain due to repeated blows to the head). Neuroimaging methods as a whole are constantly improving in their ability to detect and track recovery following TBI. And scientists are actively working toward developing more sensitive techniques to identify and predict TBI recovery. You can learn about them in our future posts. So do we stop all sports activities and forget about driving our cars to work to avoid concussion or TBI? Of course not. But, one thing is certain: we need to continue researching the immediate and long-term effects of TBI in order to improve recovery efforts, the quality of life of people with TBI, and to raise awareness about TBI and its consequences.